At all our Fiber Junkies meetings, the Show and Tell is always a highlight, with such a creative group, there's a constant stream of ooohhhs and aaahhhs going on. 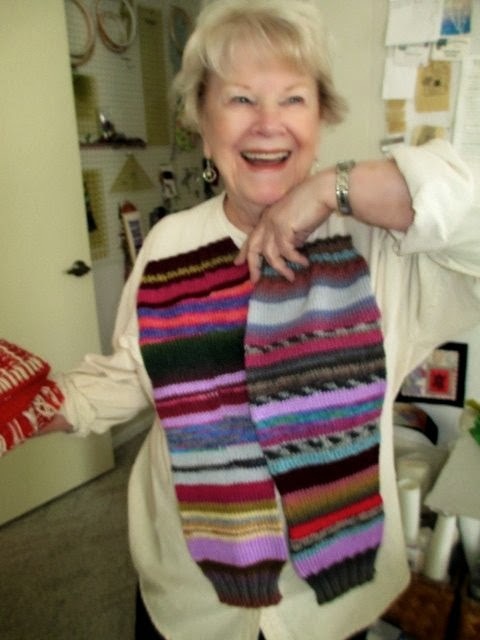 Gen who is our resident knitter and incredibly talented lady showed us her latest - leg warmers - loved the wonderful colors. 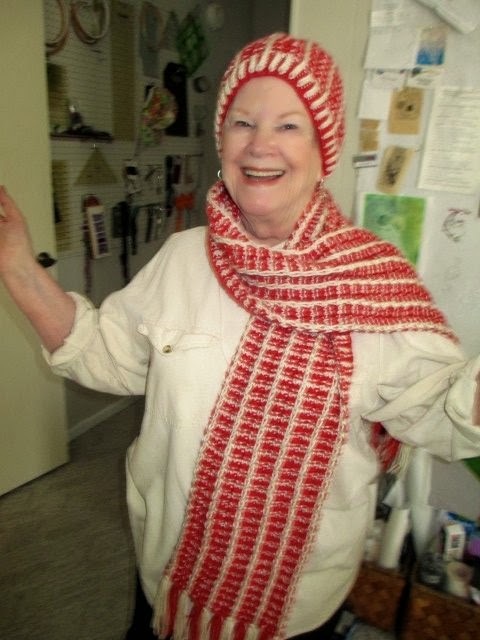 Also her latest hat and scarf set. 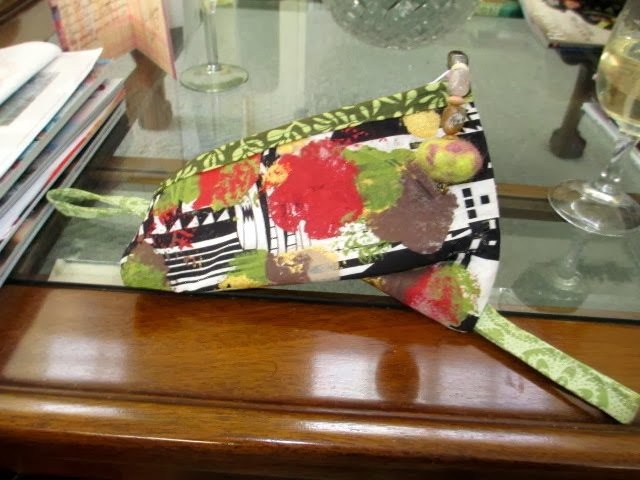 Mary shared this little bag with zipper and felted ball - hard to see but on the upper right and used as a zipper pull; it holds lots of small treasures. Mary goes to a retreat each year with long time friends. 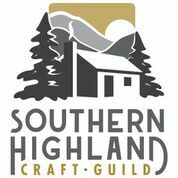 They bring gifts for each other or sometimes are challenged to create something out of the product they made to show at next year's retreat. 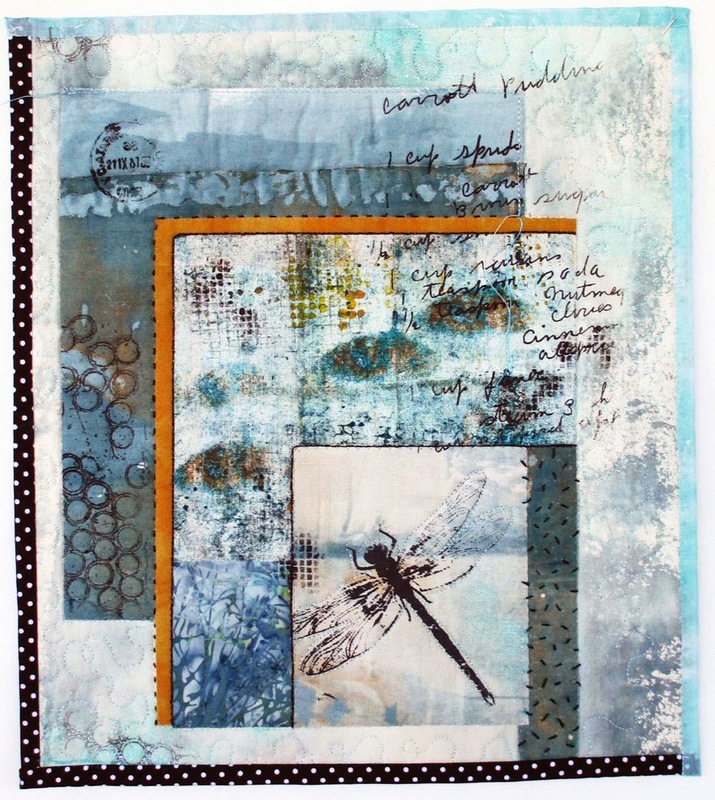 and this piece in her healing series. 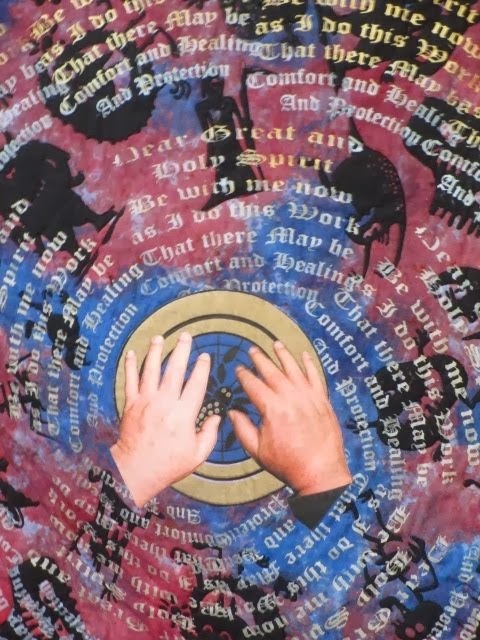 This quilt was huge and amazing - one of the healing quilts in her ongoing series. 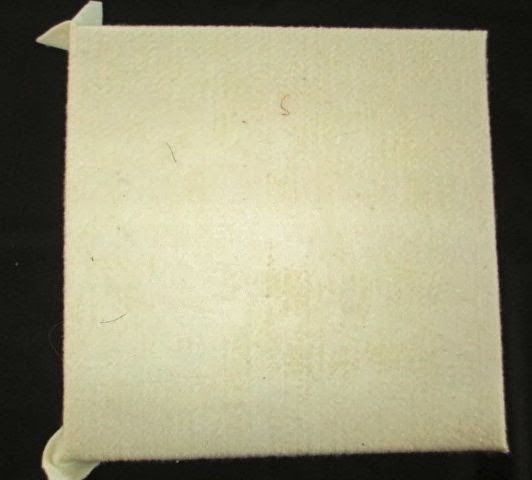 Denny created many Thermofax screens to print on the surface of this quilt. 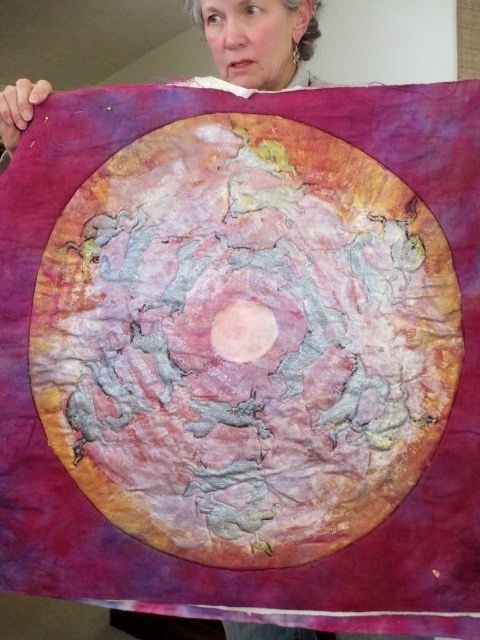 Kate has this piece in the works - her own dyed fabric screened with the gel medium we used a while back. It's a lovely piece and the colors so soft. I'm looking forward to seeing it finished. Am heading off to Florida to visit family and friends, so taking a little break and hope to have some good photos to share when I get back. Our Fiber Junkies group met yesterday at Gen's house; we were chomping at the bit to get together after all the snow delays. Kate suggested we try making vinyl silk screens - a technique she saw demonstrated at a quilt show and graciously agreed to lead the pack. 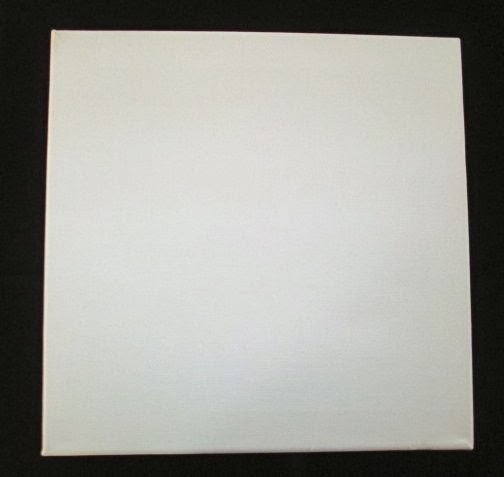 This is the package of vinyl we used. And our workspace with all the luscious colors of paint for screening. We were to bring a design that could be cut into a screen such as the one above. I originally wanted the bottom 4 pods and stem but then added the top because why not. 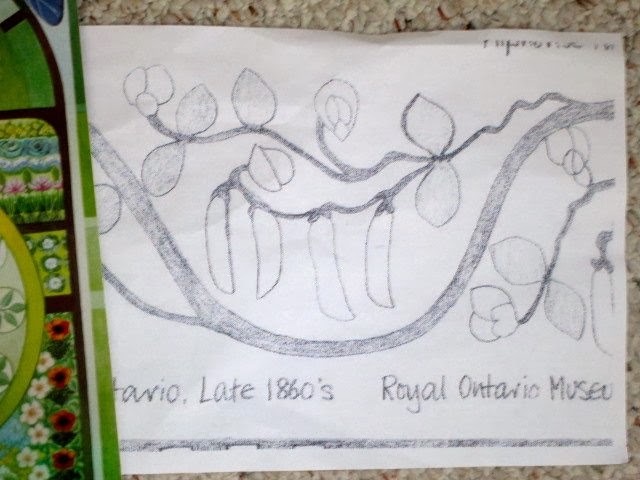 Next was the tracing of the design onto the "paper side" of the vinyl backed paper. 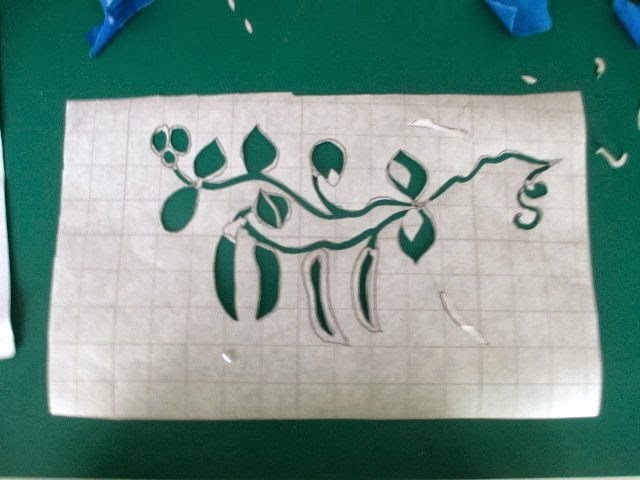 We used exacto knives and mats to cut away the design. I brought the traditional exacto knife but Kate had a variety for us to choose from. 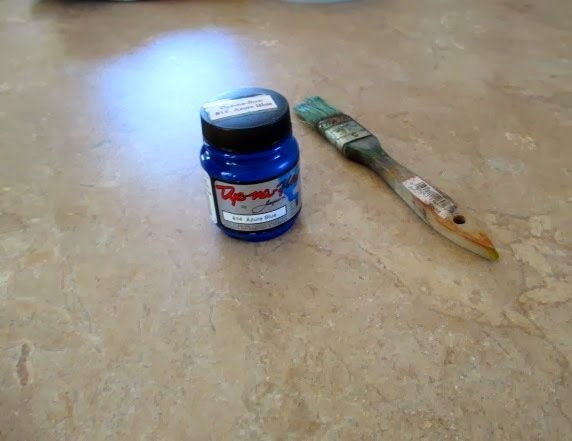 This smaller one gave me more leverage and having a hand tremor, it worked much better for me. 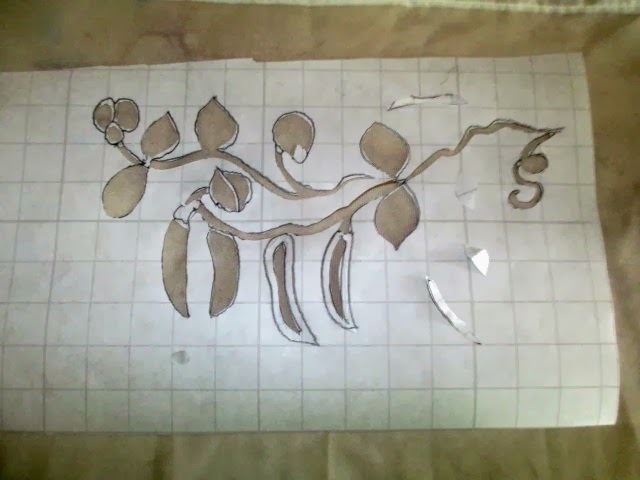 This is the design cut out and ready to mount onto the sheer fabric. A crisper sheer such as organza seemed to work better. This part was a little tricky as my design was more complex. 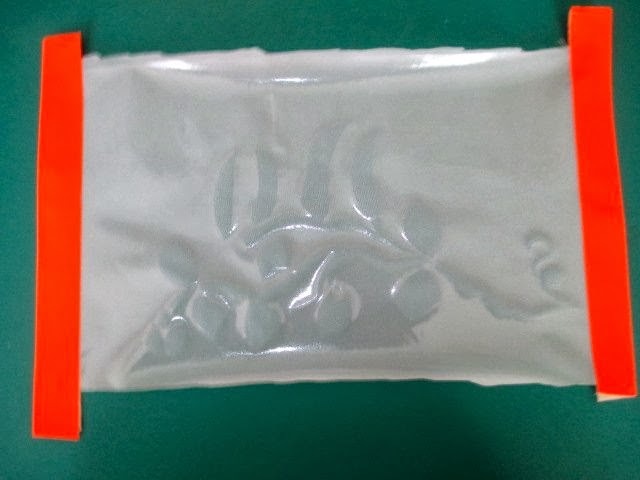 You have to peel away the paper layer - the part that looks like a grid, leaving the sticky vinyl exposed. 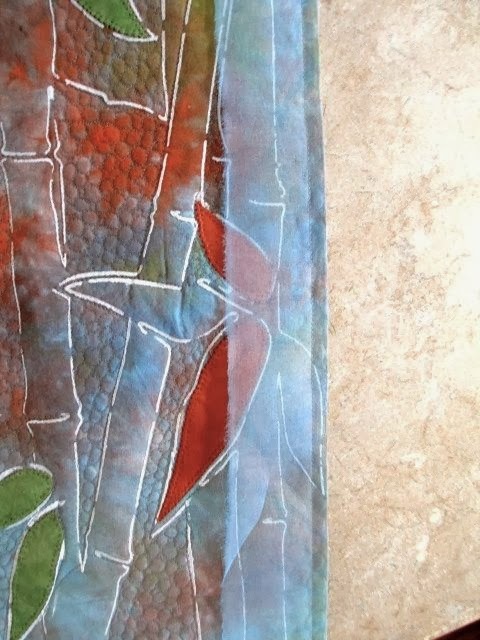 The vinyl is laid on top of the sheer fabric. I needed another pair of hands to prevent the vinyl from folding back on itself. Once it's in place, flip it over so the sheer side is facing up. 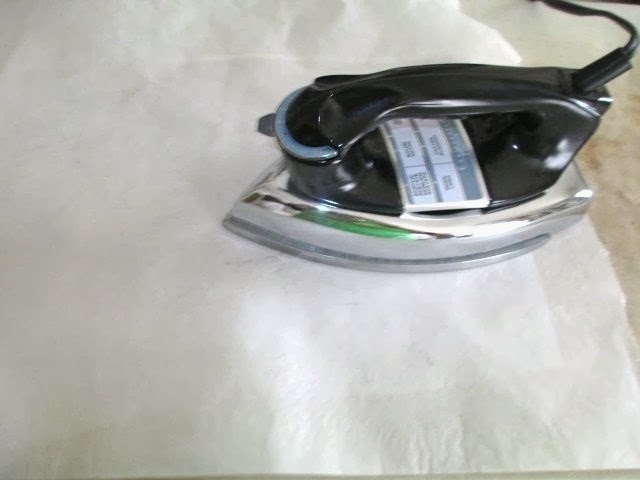 Iron with a dry iron for 8 seconds on each area allowing the vinyl to bond with the fabric. 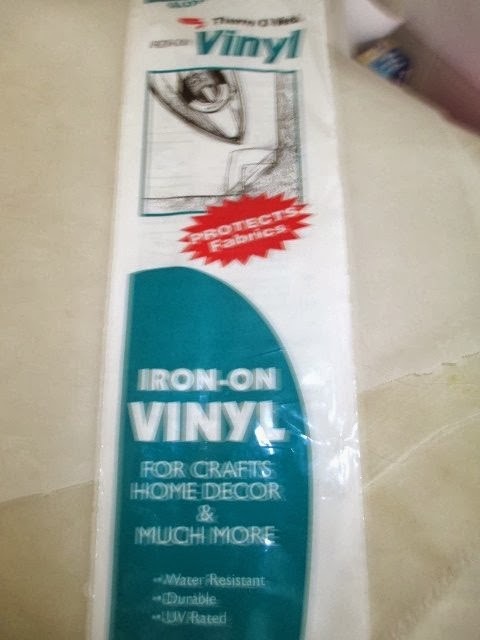 Flip it over and do the same on the other side, making sure to protect the vinyl from the iron. 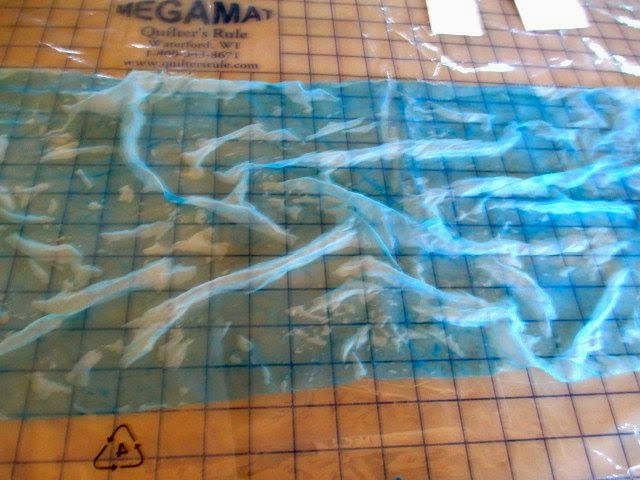 The silk screen is ready to have its edges taped for stability. Pretty colored duct tape makes it fun. 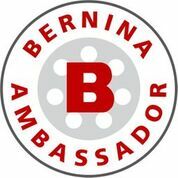 Mark the top of the screen for design orientation and also the correct side to use. You're using this screen with the vinyl on the underneath side and the sheer on top. Place it on your fabric and tape in place. 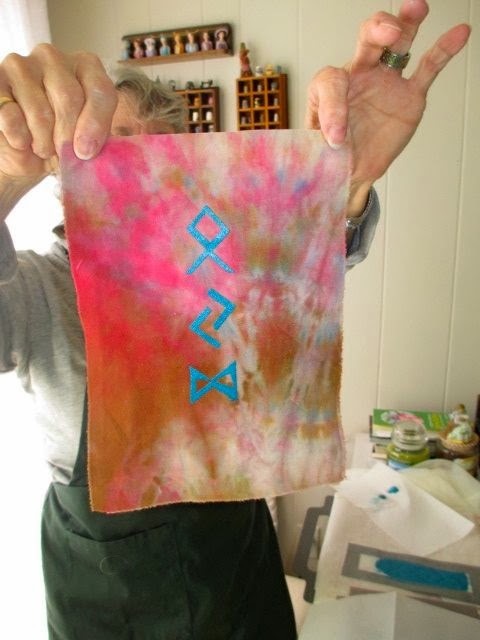 Use a textile paint for screening and here's the results. I loved the way Kate did some layering of colors - looks like a rose garden. And Denny who did more than one, but this is her first attempt. I love her choice of background fabric. 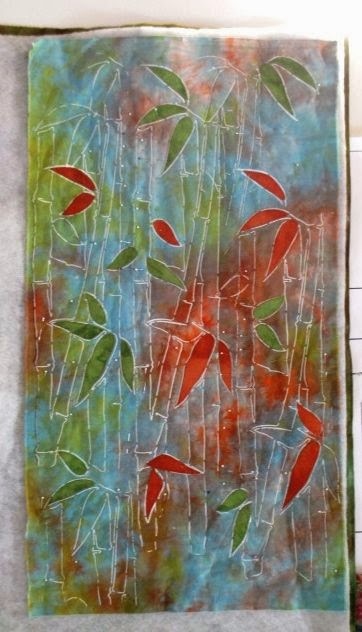 Mary had some luscious dyed charmeuse silk and this is her screen. 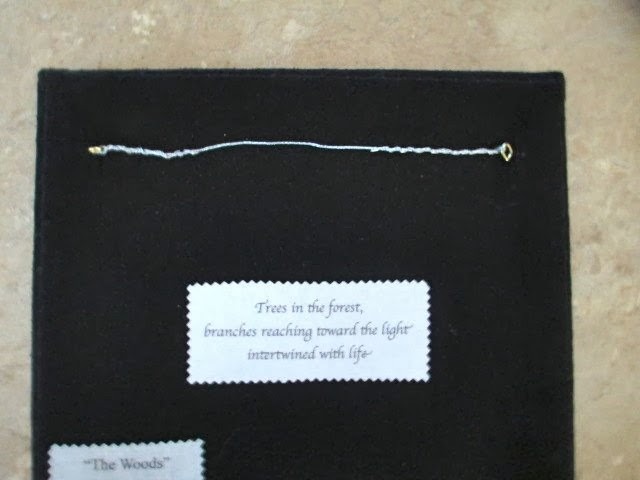 It looks like a forest which I'm sure Mary will embellish with her beautiful beading. This was a real nice alternative to using a Thermofax screen. It has a different look - a little more "hand done" which I love. You need to use more simple shapes, nothing real complex. It was a lot of fun, a great day and so good to be hanging with girlfriends again! Next time - our wonderful show and tell. I have my granddaughter and daughter with me this week so not much studio time. I've been saving this piece to show for just that time when I haven't had anything else going. I did a smaller version of this a while back for the Alzheimer's Initiative. This one was done for Galleribba - small art for the wall. 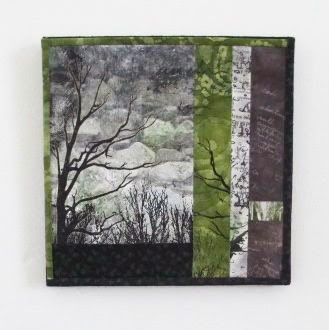 I know I've mentioned this wonderful online gallery of small quilts - Check it out here. 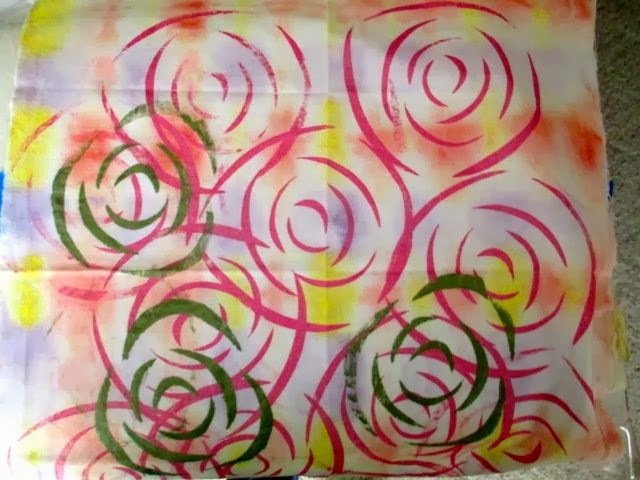 I have a lot of deconstructive screenprinted fabric I'm trying to work into some projects. I also loved screening and above is one of my grandmother's recipes for Carrot pudding.. I used my favorite stencil which is a mesh used in laying tiles (small squares) and did some hand stitching around the gold strip. 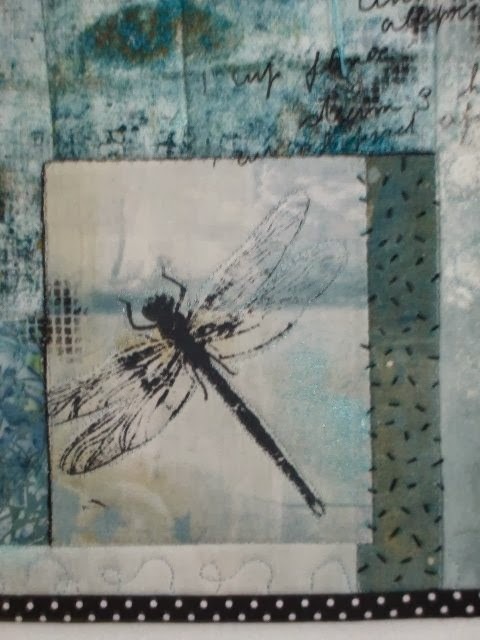 I use my screen of a dragonfly quite often - also some large stitching using 2 strands of embroidery floss. 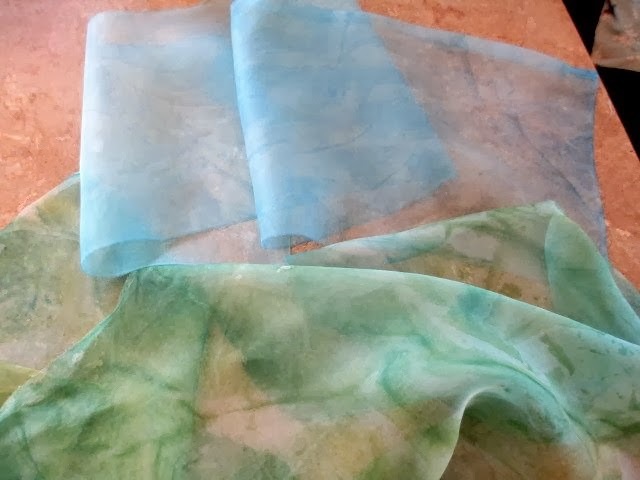 and silk organza on the other 2 sides. And the finished piece - Buzzin' which you can see at the Galleribba Gallery. 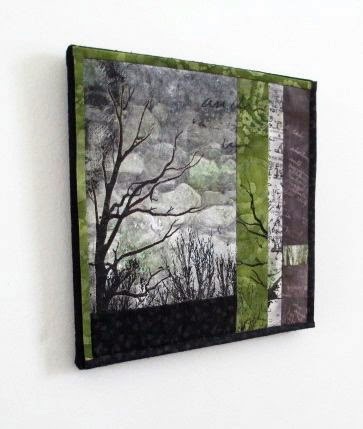 I have always liked seeing different ways to finish and display a quilt - there are many choices besides the traditional method. The museum wrap is one of my favorites but you need quite a bit of extra fabric to wrap around the 1 1/4" edge to the back. 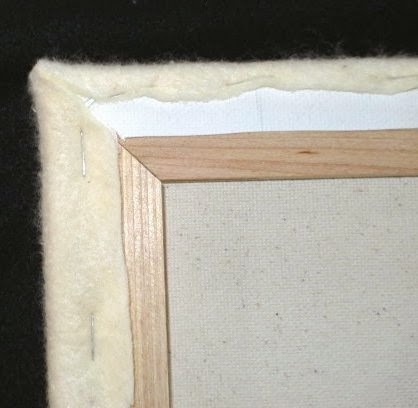 I often forget to leave the extra which leads me to mounting pieces on prestretched (and standard sized) canvas. 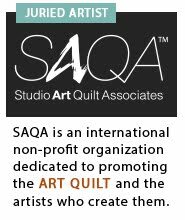 This method works well with small quilts. 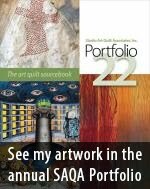 I'm part of an online gallery - Galleribba which requires you to make pieces 12" or smaller...It's a wonderful gallery - check it out by clicking on the link above. 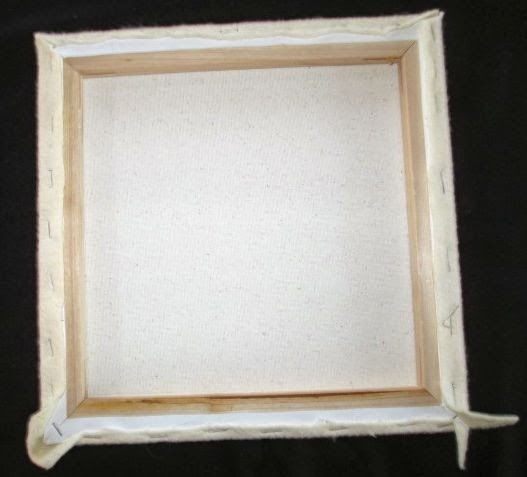 Back on track, I buy 12" canvas's from a local chain craft store - ready to use. It doesn't have to be the best quality as they'll be covered. On sale, they're @ $2. each, less expensive than 4 stretcher bars. The first step is to cover them with a thin batting. The corners need to be cut and not overlapped - this is to prevent bulk. The batting stretches to the back and is stapled in place. An electric or heavy duty stapler is needed; using a regular one will not hold the batting and fabric in place. I usually place staples around an inch apart. You can see how the corners have been trimmed and neatened up. 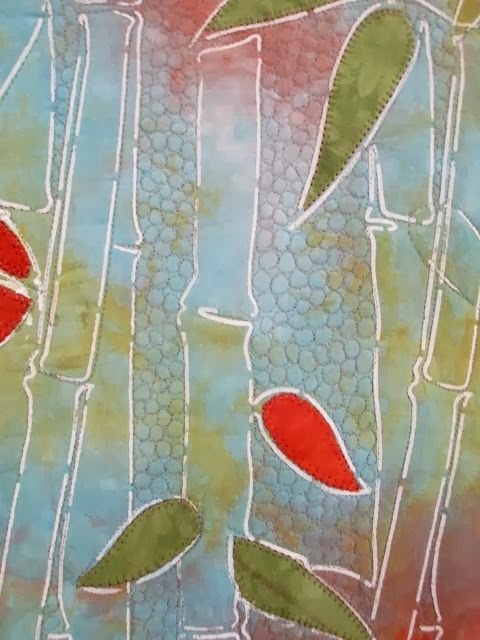 Next step is to mount the quilt on the background fabric. 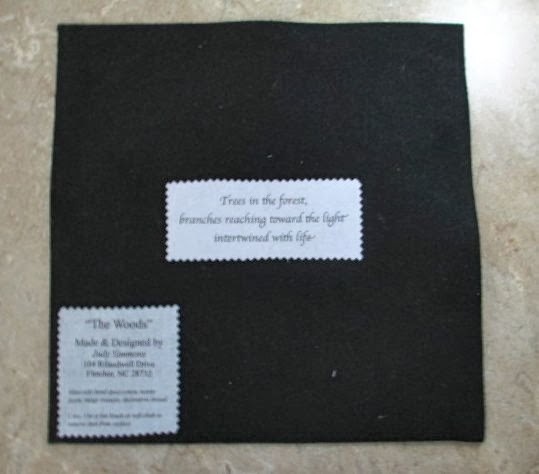 I use black fabric to wrap the canvas and have a roll of black silk noil which I keep for just this purpose - it keeps all pieces consistent. 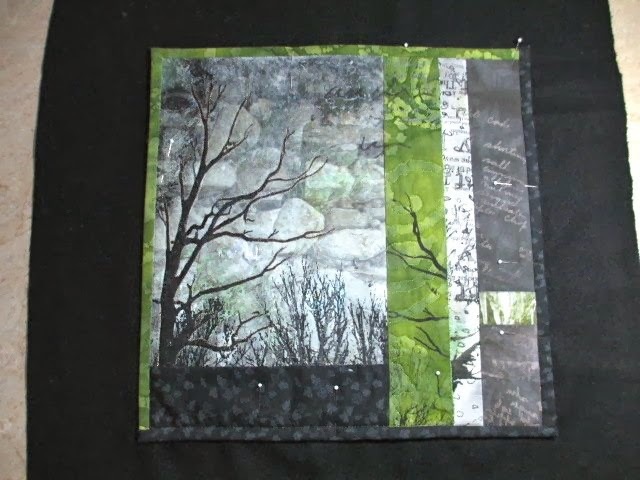 Next I center my 12" quilt on the black fabric and pin well. There is at least a 2" overhang of black all around. 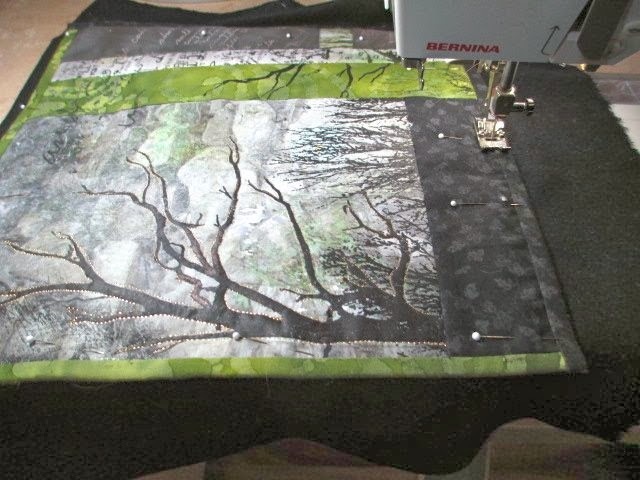 Using an invisible thread, I stitch the quilt to the black fabric, stitching in the ditch where the binding seam meets the quilt. I remove any forgotten pins. 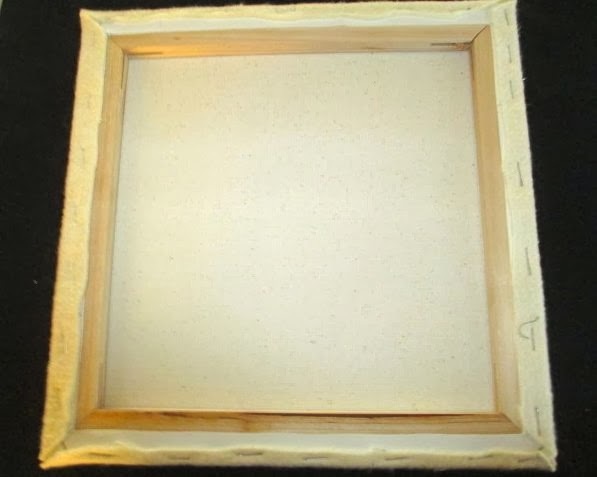 I then lay the piece on top of canvas/batting. and staple in the middle on all 4 sides. I once again flip it to make sure it's where it needs to be. 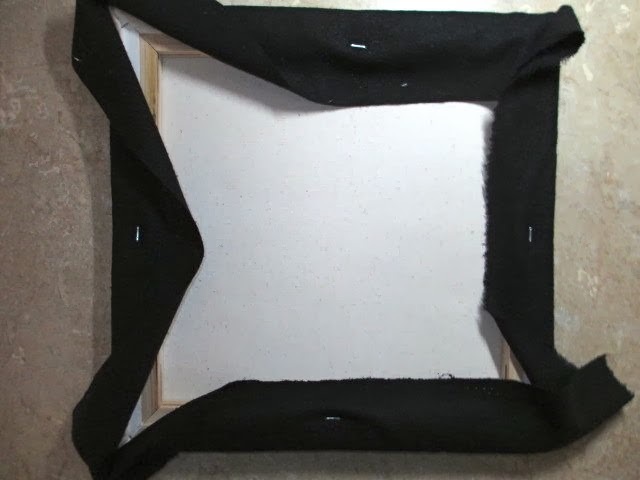 I staple the black fabric to the back of the canvas. It's best to alternate sides - staple a couple of places on first side, then a couple on opposite side, then top and bottom always working from center out. 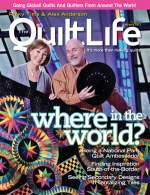 Every so often, flip it over to make sure the quilt is still where it needs to be. 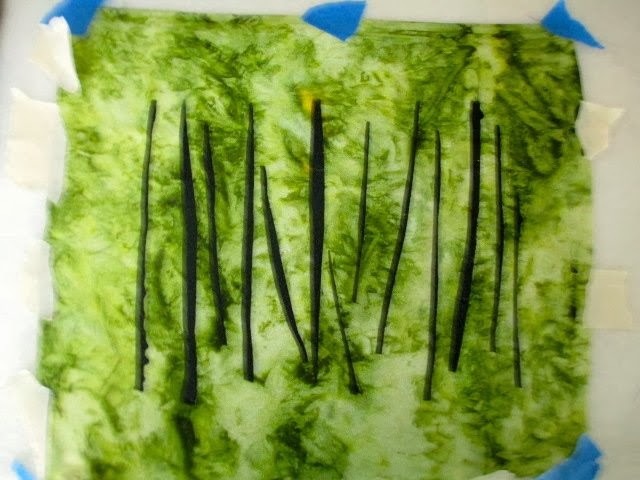 Next, I make a backing to cover up the staples and give it a finished look. 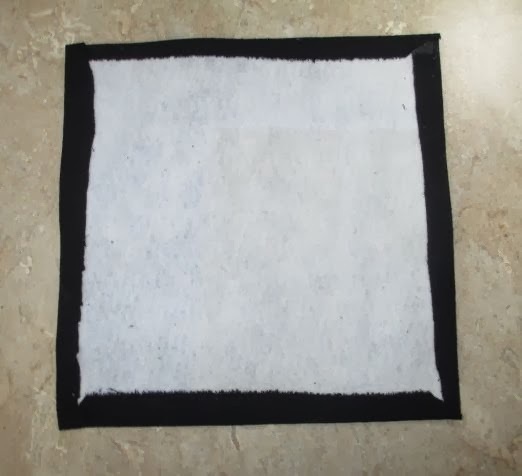 To do this, cut a piece of heavy weight interfacing a tad smaller than the canvas - around 11 3/4" square, spray with a quilt adhesive (I use 505) and lay on top of black fabric. Iron edges to back, hold in place with double stick tape. You only need to do this in a few places. 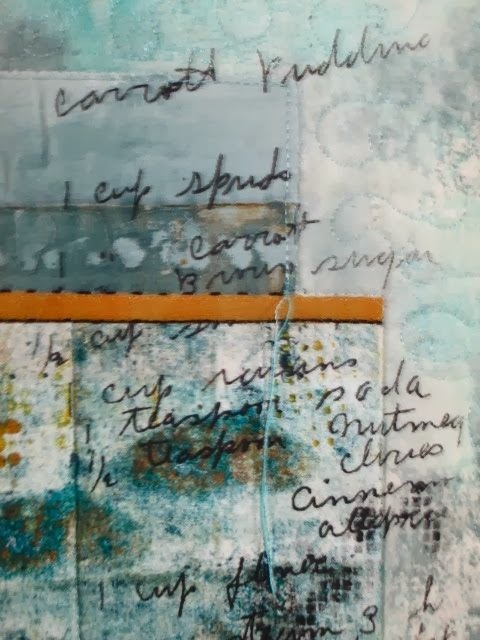 Add your labels - my smaller pieces have a Haiku on the back which I center in the middle. 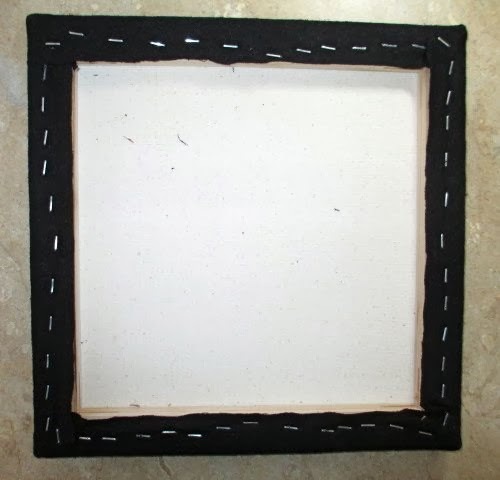 Place backing on top of open back and put a few pins in corners to hold in place. 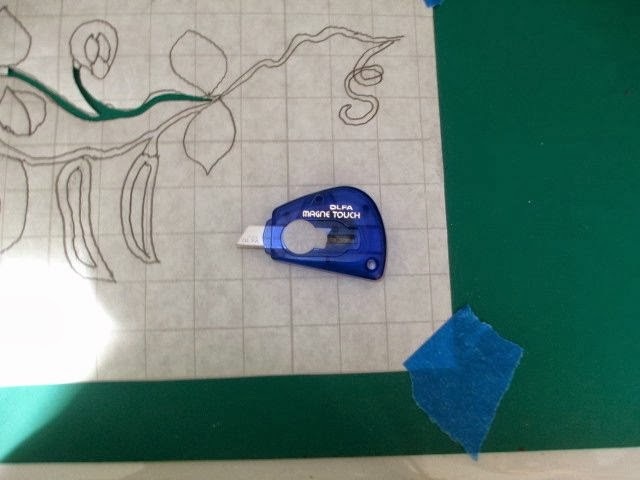 This is the tedious part - to hand stitch the backing to the edge. I've tried fusing but it's not as nice or strong an edge. I found this wonderful curved needle which is used in upholstery but perfect here...makes it so much easier. 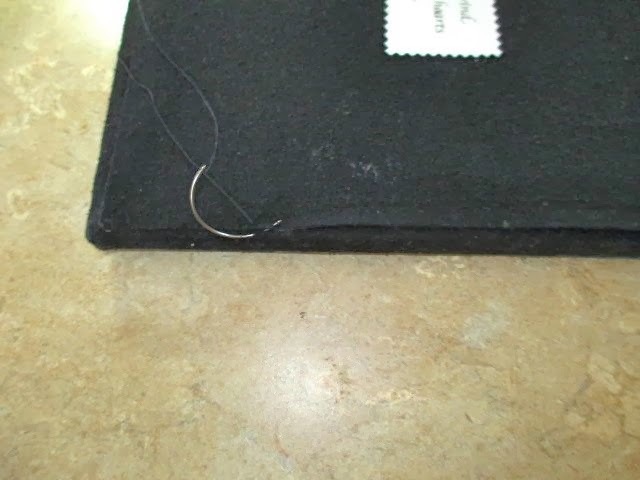 I use small eye hooks which go right through the backing fabric and then picture frame wire which is softer and easier to bend. and the nice presentation from the front...The piece is called "The Woods" and is in the Galleribba (link above) and also on my website . 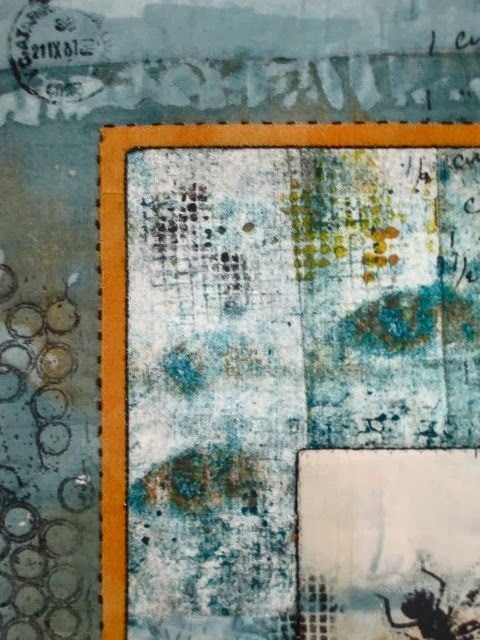 To all my "snowbound" friends, hope you're having some quality time in your studio. Hugs for a Happy Valentines Day! 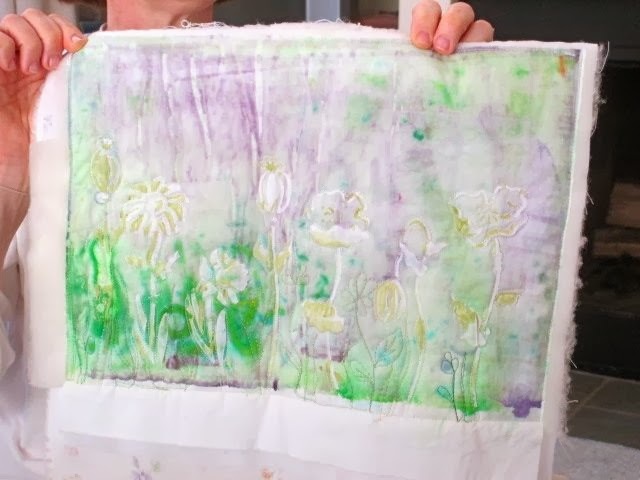 I started a piece a while back as a result of creating fabric using a stencil and modeling paste at a Fiber Junkies meeting..To see the beginnings, click on this link. It's been ready for stitching for a while. 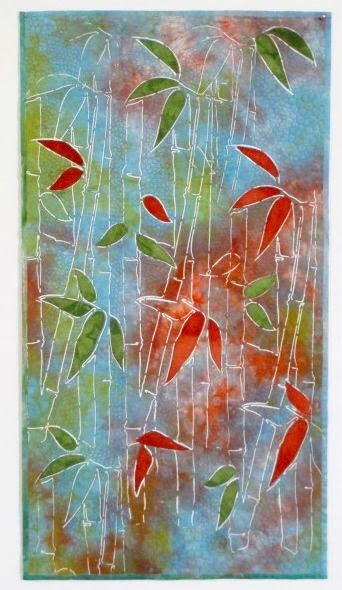 I played around with a few ideas on how to handle the bamboo - whether to outline it and leave the background plain or do something to make it pop. 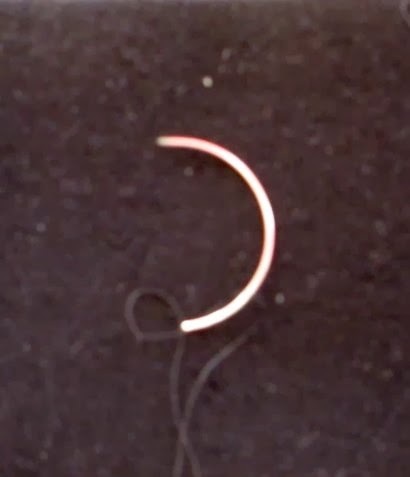 I also had a lot of thread choices to make. I often use a monofilament when I want the stitching to be subtle, but in this case it was too quiet and the rayon was too bold. My friend kate, who has lots of different threads brought me some to preview and help with the decision. I used Bottom Line by Superior in a gray color. 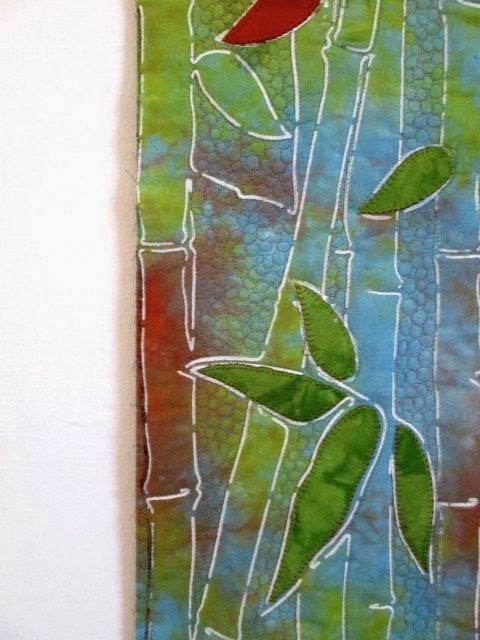 It's very thin but still added some presence and color when I stitched around each line. The gray also blended nicely with the variety of colors in the piece. 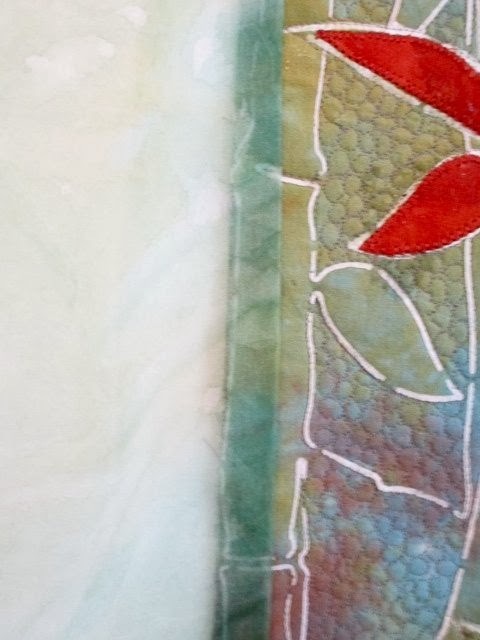 I've become addicted to using silk organza as a binding because it offers such a soft edge both in color and in texture. 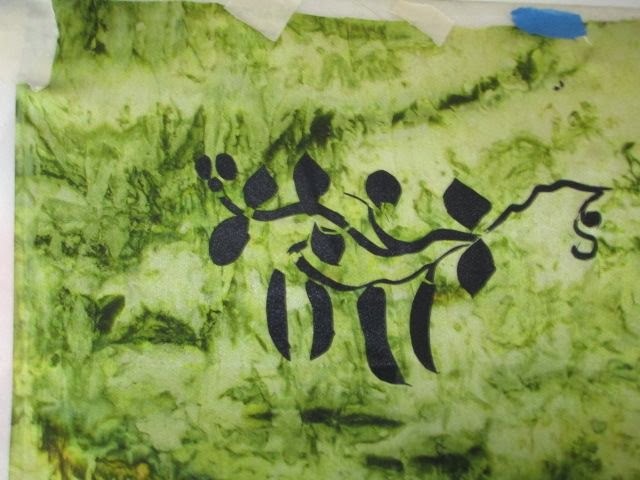 I painted a piece using a very light wash of Dye-na-Flow. 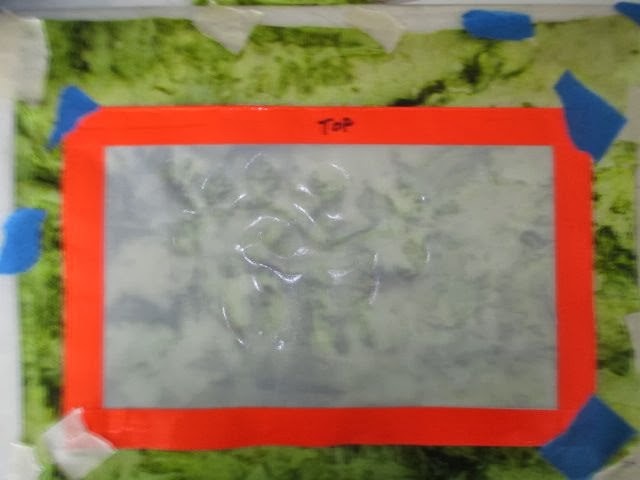 I laid plastic down to protect the surface underneath, crumpled up the organza and applied the paint in a very haphazard fashion. 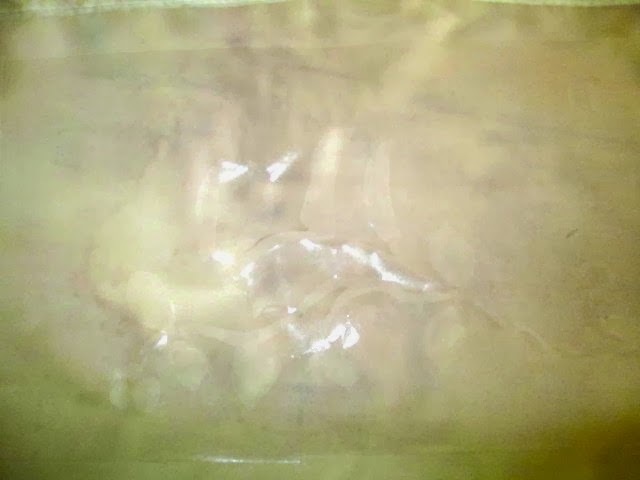 Having the silk crumpled will give you variations of color throughout as seen below. I decided to paint 2 different color ways as the edges were so different...wanted to see which worked best. and the other side a lot of blue. 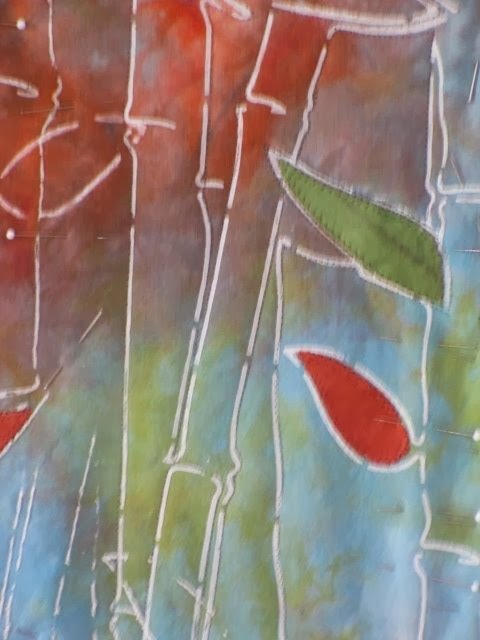 When you use organza as a binding, it folds back on itself as any binding does, but because it is transparent, the color will deepen so it's a good idea to preview it on the edge by doubling it. 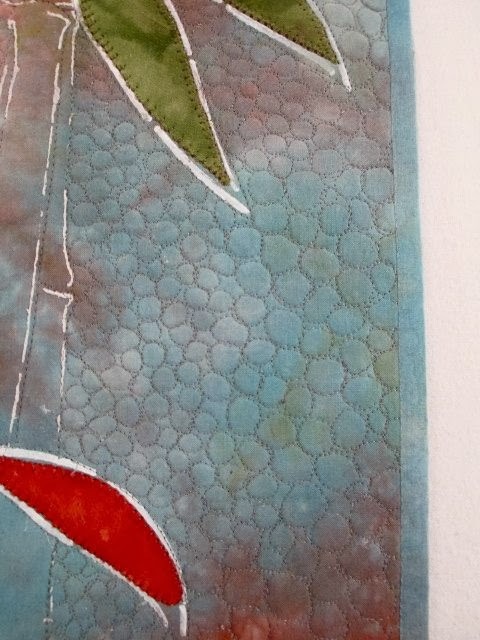 Here is the green edge and you can see the sheer organza in the single layer off to the left. and here it is finished - a nice soft edge. 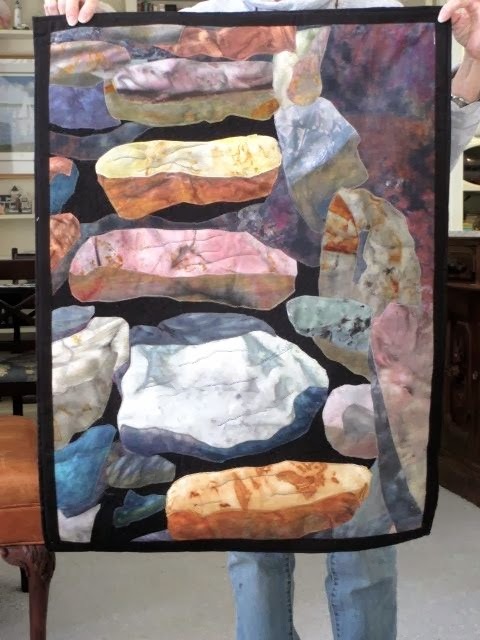 I like the fact that you can see through to the quilt. 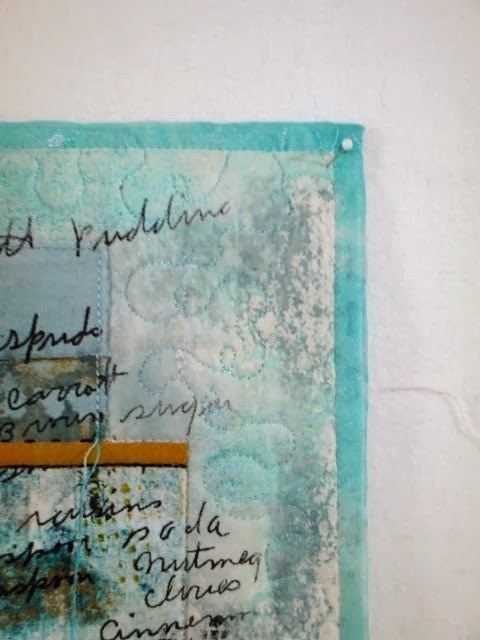 The stenciling on this piece came right to the edge in places and you're able to see that through the binding. 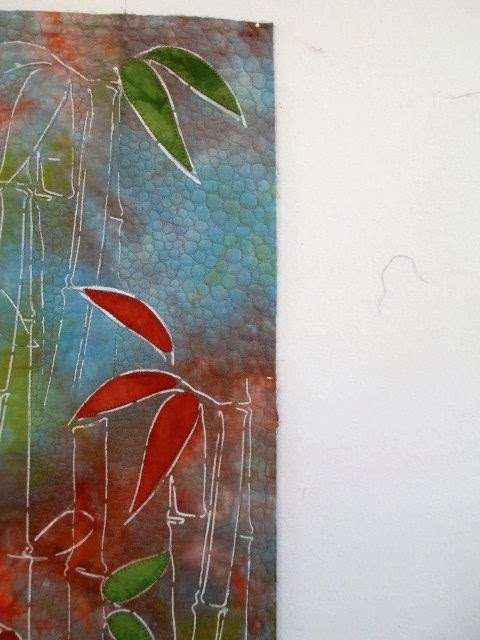 I tried several types of quilting for the background, something that would sink the background, be interesting but subtle. My friend Kate also suggested the circles, it is something she uses often and it's very effective. 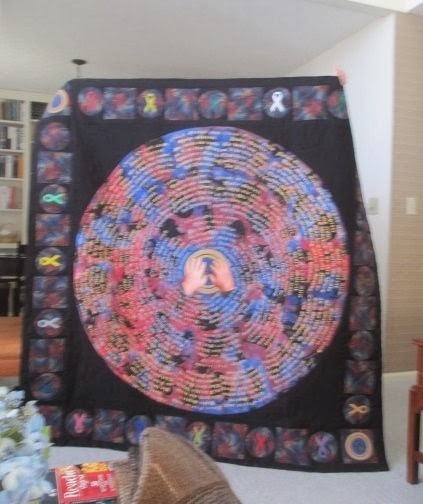 The circles were smaller in the main part of the quilt and larger near the edge (see 2 pictures up). 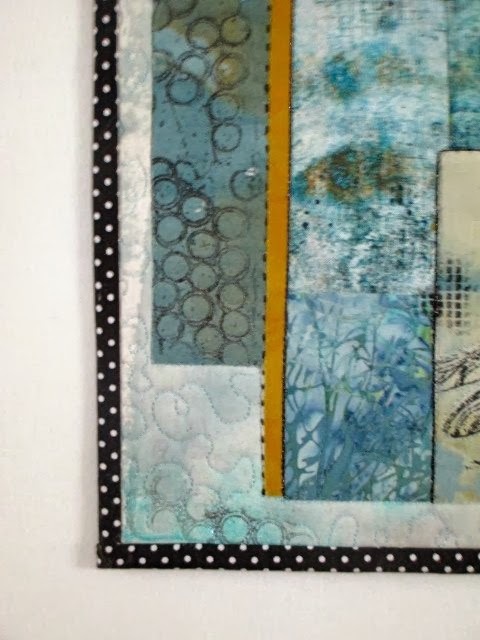 The combination of the thread and pattern worked well with this piece. And the finished piece. 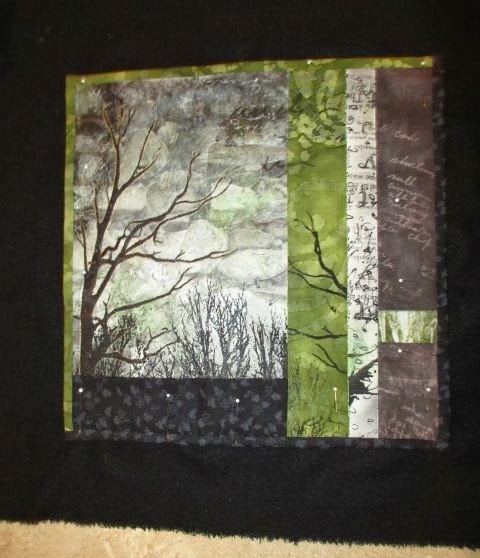 I like the results and what started out as an exercise at my Fiber Junkies group turned into a quilt. I love this group and all the wonderful things we experiment with and learn from each other, but I consider these play days. Being able to create a piece of art is just the icing on the cake.